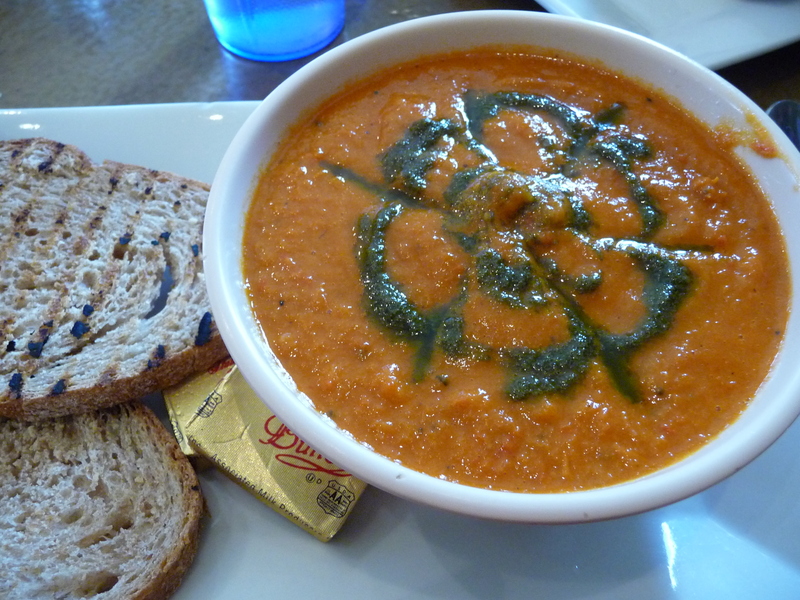 Red pepper and onion soup, Luna Cafe, Summerland, Calif.
We’re in the thick of what I like to think of as soup season. Of course, you can eat soup any time of the year–perhaps eating cold soups in the summer, or, as my father liked to do, eating hot soup as a first course for lunch or supper no matter what the weather. In my mother’s senior residence, they serve soup at every meal except breakfast — there are a lot of German-born folks who want soup all year round. But I think the real heart of soup season, the time when soup stars as main and most appreciated course, is that extended wintry period between November and March, when the weather is cold, gloomy, stormy, snowy, rainy, foggy, cloudy, chilly. Then a hearty soup warms and soothes you like nothing else. 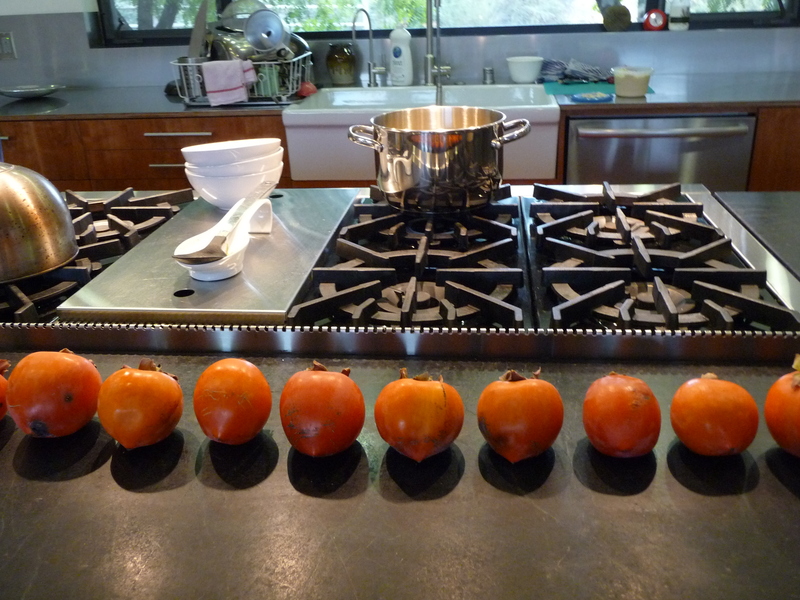 Anna had a welcoming pot of green soup for us on the stove (which was decorated with a row of ripe persimmons). We ate bowls of the lovely green soup (it had kale and white yams, onions and I’m not sure what else), topped with a drizzle of olive oil, some toasted pumpkin seeds and crumbles of feta cheese. Along with some multigrain bread, it was just the kind of meal we love. And we had slices of those persimmons for dessert. In Love Soup, Anna writes about how she first devised green soup–a puree of kale, cilantro, potato and sauteed onions and garlic–in order to lose some holiday pounds one January. She soon was experimenting with all kinds of varieties–adding sauteed mushrooms, substituting yams for potatoes, using spinach or watercress or beet greens for the greens–and inviting friends over to share her discovery. I think of Anna Thomas as The Queen of Green. For me, soup season includes my favorite version of green soup (parsley and potato, a recipe that my friend Peggy gave me years ago), as well as an earthy mushroom-barley soup, a velvety butternut squash soup, a sweet-and-sour cabbage-beet borscht, and many, many pots of that infinitely adaptable standby, minestrone….otherwise known as vegetable soup. Sometimes I even open a cookbook and try something new. 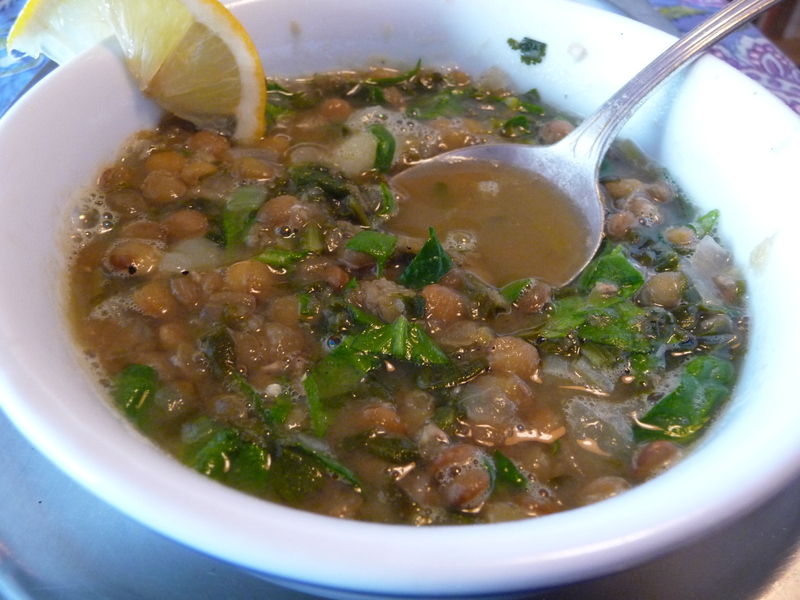 When I was testing out lemon recipes, I looked in Claudia Roden’s The New Book of Middle Eastern Food, and tried the recipe for a Lebanese soup called Shorbet Adds bil Hamud, or “Lemony Spinach and Brown Lentil Soup.” It was so good that it’s become a regular part of my repertoire. The greens brighten up the brown lentils and plenty of lemon juice gives a fresh lively flavor–a great combination. Plus it’s simple to make. And fast — the lentils and diced potatoes cook in under half an hour, and you toss in the greens and have a nice nutritious and tasty bowl of soup ready before you know it. Quick, uncomplicated, healthy, good-tasting. What else could you ask for in a soup? Oh, yes, it’s vegan as well. In a large pan, sauté the onions until soft and golden. Add the garlic and stir until it begins to color. Add the lentils and potatoes, and the water or stock and simmer for 25 minutes, or until the lentils are tender. Add the spinach and cilantro to the soup and season with salt and pepper (another note: I sometimes also stir in some cumin). Stir well and add water, if necessary, if you wish a lighter consistency. Cook a few minutes more and add lemons to taste (it should be nice and tangy) before serving. Variation: For an alternative flavoring, fry 4 or 5 crushed garlic cloves in 2 tablespoons extra-virgin olive oil with 2 teaspoons ground coriander until the aroma rises. Stir this sauce, called takelya, into the soup just before serving. Don't forget the lemon--it's essential! You dropped in on Anna Thomas?! Fantastic! I should make more soups like this. Pork loin roast tonight. What can I say? Soup another day. What a wonderful blog! Great layout and links too. I’ll check this out regularly. I too have spent time in Anna’s kitchen having green soup and you described that happy experience beautifully. 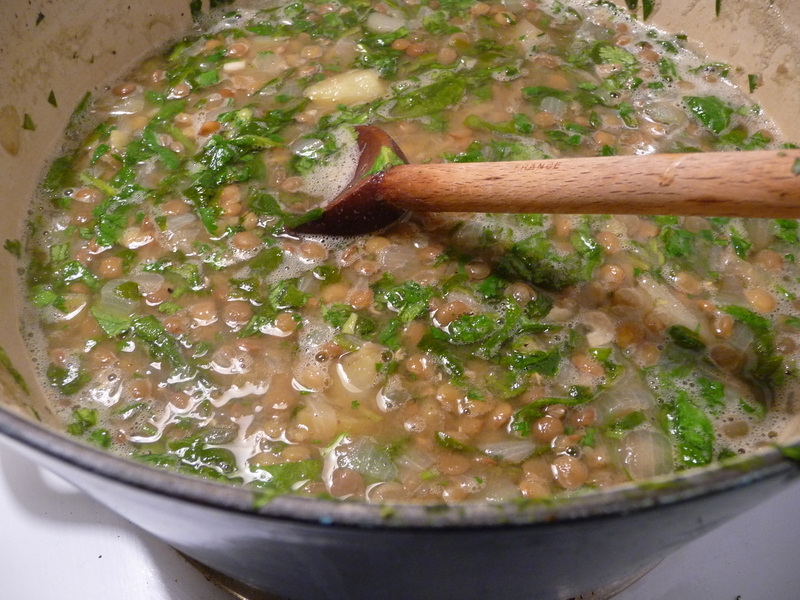 Loved your Lemony Lentil soup recipe–my next soup experiment! delightful writing about food. want soup now and it is breakfast time. 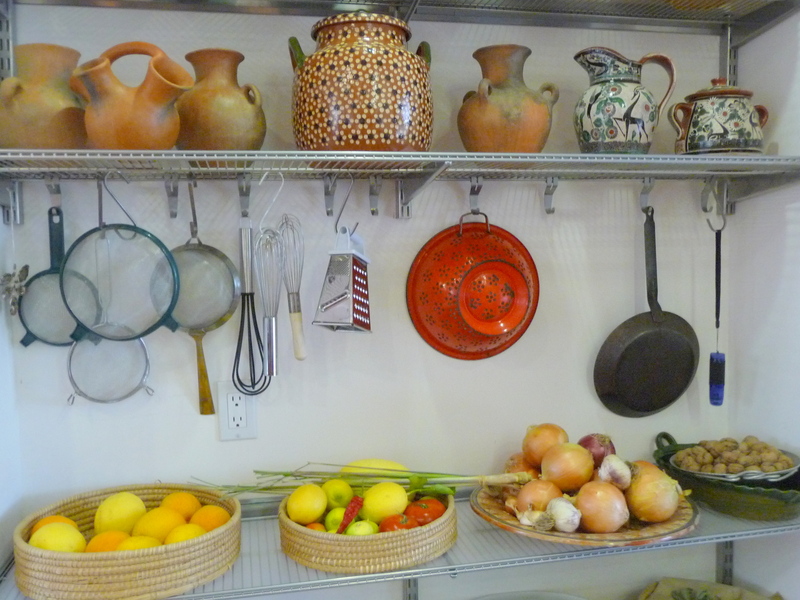 spot-on writing about Anna and her artful kitchen and delicious soups. I love soup and really enjoyed your blog. I am always looking for new recipes so keep up the good work. By the way, I am a fan of Anna’s too. love soup mmmmmm…i, too, come from a family where soup was always served before the dinner (my dad had to have it “piping hot”!). must be that eastern european background that we share, and having parents that lived through the great depression. my favorite way to eat is to make a big pot of soup on sunday, and a pot of brown rice, and work on them all week. doesn’t necessarily work for teenagers! Who can resist Anna Thomas’ Green Soups?